For a few years now, Microsoft has been trying to blur the lines between its Surface Pro line of tablets and conventional laptops in the minds of consumers, but objective data shows that this just isn't happening. Indeed, Microsoft's sales with the Surface line (RT included) have been rather disappointing on the whole, and that really got us thinking. Did you like what Microsoft has in store this time around? There are obviously cons and pros with the Surface Pro 3. For example, while build quality is outstanding, the price tag attached is quite prohibitive (the cheapest version starts at $799 without the keyboard accessory). The tablet, with its 12-inch screen and weight of 800 grams, is also quite bulky, though that's not necessarily a con for everyone, especially those who crave a larger form factor. Lastly, while some will rejoice at the availability of the fully-fledged Windows 8.1 Pro platform, we suspect quite a few people we'll be unhappy with the poor app ecosystem available to the OS, especially when considering what's available to iOS and Android. Obviously, we're only scratching the surface (get it?) here, and we're sure many of you will have other reasons, or a mix of many. But beyond those, what we really (and we're sure Microsoft too) want to know is what you thought of the new Surface Pro 3. Did you think it's a work of art, or an overpriced junk? Perhaps something in between? Let us know by casting your vote. It feels like the first one just came out! Macbook air is more expensive, pro 3 has better specs, resolution that makes the air look like a toy, touch screen, hybrid(tablet, ultrabook), pen that works great and can be used for designers. And much more. Besides few hours of extra battery air has nothing better than pro 3 but it sells like hotcakes. No its not embarrassing, thats how quality ultrabooks are priced. Its not a tablet that you can buy for 500$. Its a high end ultrabook in tablet form factor. What would justify the price?? This guy is definitely an apple fanboy in disguise. Windows 8.1 is very stable and secure. I love it on my custom build. 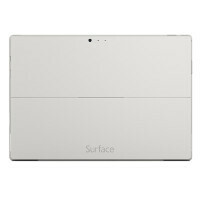 Actually, the iCore 5 128GB Surface Pro is $999.00 where the MacBook Air is $899. I'll give you the resolution, and I personally never cared for a touchscreen laptop. It's either a laptop or a tablet. I say pick one. But you should really wait for the MacBook Air to update, before comparing it to an "unreleased" new product from a competitor. No? using android apps, not android....huge difference. That is like saying to the millions of people that use MS Office....that's great use windows...amazing. I think it's a great, yet niche, product. It's perfect for business, especially a more forward thinking, outside the box kind of office. Portability and all the power you need for enterprise applications. The downside is that it lacks any real benefit as a pure consumer product. It's not matching up as a content consumption device (when you consider price/value) and it lacks the ability to be a "gaming" machine. If it doesn't have a fingerprint reader with top authentication security, I'm not interested. It has a full-sized USB port. A peripheral fingerprint scanner would probably work better than whatever MS would choose to build into it. This is supposed to be a handy mobile computer. I wouldn't want to have to carry a fingerprint reader accessory around with me and have to plug it in every time I turned the computer on. If Apple and Samsung can build fingerprint sensors into their smartphones, MS should be able to build one into their tablets along with Trusted Platform Modules (TPM) and multi-factor authentication. I'm hoping to replace my desktop with a windows tablet with top biometric authentication security and secure mobile payments built in. No 4G/LTE ?!... Not for me then. We are now living in the age of communication and connectivity, until they come up with 4G/LTE I will stick to my Samsung Galaxy Note Pro 12.2. Otherwise it is a positive step forward (so much power with such reasonable weight...) and an extremely appealing design. Because being charged for an additional line is silly. I am rarely without a phone/tablet combo. When i am, the tablet is in a spot of wifi. If my phone doesnt get signal neither will the tablet regardless. considering tethering options for my carrier are much cheaper, there is no point for 4g/lte at this time imo that is. If it had integrated LTE, I would think about replacing my Duo 13 with it. tether your phone, at least on my carrier it is cheaper to do so anyways. i'm a gamer and i want my laptop to have a powerful GPU and any cooling system, so that it won't fry off. If Microsoft want to replace my laptop, then this is a big failure, and it is overpriced. Other than that it is a great device. I'm a person with a lap and I want my laptop to work while it's sitting on my lap (you know, like a LAPtop should?) If Microsoft wants to replace my laptop, then this is a big failure unless I can get a case-keyboard combination that allows the screen to be positioned sturdily at multiple angles. Oh, and balancing it on my legs with a kickstand doesn't count. Thanks. Clueless troll. This isnt a gaming laptop neither its aimed at gamers. Its aimed to replace ULTRABOOKS, and normal non gaming laptops.